America’s Rich Fellers and the amazing Irish-bred stallion Flexible stormed to victory in a thrilling third-round jump-off at the Rolex FEI World Cup™ Jumping Final in ‘s-Hertogenbosch, The Netherlands today. Only Switzerland’s Steve Guerdat and his 11-year-old gelding, Nino des Buissonnets, were left to challenge the US partnership against the clock in the closing stages, but despite a superb effort, they had to yield to the pure determination of a horse and rider who, quite simply, never give up. Flexible was all but written off twice during his career due to severe injury, but overcame the odds to return to the top of the sport each time. For the legion of fans who have followed the 16-year-old son of Cruising and his rider from Oregon (USA) who bought the chestnut stallion in Cavan, Ireland 10 years ago, today was a dream come true. Unorthodox in his movement and jumping style, and the oldest in the competition at 16 years of age, Flexible showed the same kind of spirit as his sire, Cruising, who was runner-up at the FEI World Cup™ Jumping Final 13 years ago in Gothenburg (SWE). Flexible was second at the same venue himself in 2008, and has competed at all of the last five Rolex FEI World Cup™ Jumping Finals, but today it was his turn to stand under the spotlight. And the courageous stallion and his rider fought every inch of the way, bringing the packed stadium at the Brabanthalle in ‘s-Hertogenbosch to their feet in an emotional tribute after their incredible round in the jump-off, while it was Guerdat who stood second on the podium ahead of fellow-countryman Pius Schwizer in third. Louis Konickx’s 12-fence first-round track really pulled the strongest jumpers out of the pack of 24 final-day starters, with the home crowd unable to conceal their delight when local man, Maikel van der Vleuten, produced the first zero score when 12th into the ring with VDL Groep Verdi. The questions were clear but the time-allowed, even when extended from 65 seconds to 68, was tight, and it took strong riding from the very best of them to return a clean sheet. Sweden’s Rolf-Goran Bengtsson showed exactly why he is currently No. 1 on the Rolex Rankings as well as reigning European Champion when following suit with Casall la Silla. The final triple combination quickly became the bogey, and Germany’s Philipp Weishaupt and his winner of Friday’s second competition Monte Bellini looked set for a fault-free effort only to lose momentum on the approach, and without enough power the stallion was unable to leave the final element up. It came down to the last four riders before another fault-free effort was recorded, Kevin Staut’s grey mare, Silvana HDC, giving it everything she had to leave the course intact before Guerdat (Nino des Buissonnets) and Fellers (Flexible) did likewise. Ahead by just a single point going into the final day, Schwizer was obliged to carry a single penalty into round two however, after falling foul of the clock in his first round with Carlina, so there was nothing separating him from Guerdat and Fellers, while Staut stalked the leading pack in fourth position carrying three points, as they set off over the second-round course. Konickx left them with just six fences and seven jumping efforts to decide the winner, and Guerdat set the target with one more fabulous clear, crossing the line in 26.61 seconds with his horse which appears to have unlimited scope. The American was waiting in the wings and saw the Swiss rider go. “I hopped off and watched Steve through the curtains – I thought it was seven (strides) from the triple bar (second-last on the jump-off course) to the Rolex vertical (last fence) but he did eight. I know Flexible very well and he’s quick across the ground. I don’t know Steve’s horse but I just trusted that I could do eight to the last and be faster and be lucky.” And so he was, breaking the beam in 25.97 seconds. Guerdat said afterwards, “my horse is very fast and I thought without taking too much risk it would be enough, but afterwards I realised I lost time turning back to the triple bar. I can only blame myself and I’ll have to do better next time,” he said. And he talked about his wonder-horse whose resilience is something of a phenomenon. “He was, as a younger horse, extremely excitable. He’s very quick and twitchy. He’s kind of a wild character, but he’s gradually mellowed as he’s matured. He’s like a pet, I love him and he loves me, we have a great relationship and we know each other very well,” he explained. Flexible now has “a week, or maybe nine or 10 days” before he returns to the US to compete in the US Olympic Trials in Del Mar, California. Not much time to rest on his laurels, but somehow it seems that this relatively old horse, and his 52-year-old rider, are on an upward trajectory that will take them to this summer’s Olympic Games and all the possibilities that that can bring. The 2011/2012 Rolex FEI World Cup™ Jumping Final could hardly have come to a more exciting conclusion. The win today brings the US tally of FEI World Cup™ Jumping victories to eight in the 34-year history of a series that identifies, without doubt, the greatest horses of their era. And in the lead-up to an Olympic summer, the Rolex title is the greatest boost to confidence and belief that any horse-and-rider combination could wish for. (First two riders went into third-round jump-off against the clock today) 1. Rich Fellers (Flexible) USA 0/0/0 5.97; 2, Steve Guerdat (Nino des Buissonnets) SUI 0/0/0 26.61. Remaining riders finished with the following penalty points: 3, Pius Schwizer (SUI) 5; 4, Philipp Weishaupt (GER) 10; 5, Kevin Staut (FRA) 11; 6, Rolf-Goran Bengtsson (SWE) 12; 7, Marcus Ehning (GER) 15; 7, Marcus Ehning (GER) 15; 9, Rik Hemeryck (BEL) 16; 10, Harrie Smolders (NED) 17. This is the 34th Final in the history of the FEI World Cup™ Jumping series. Today’s track, built by Dutch course designer Louise Konickx, had 12 fences. Fence 5 was another innovatively designed obstacle consisting of a spread of three poles but not a tradition triple-bar – instead the front and back rails were crossed. 4 fences stood at 1.60m – all verticals, at 3, 6, 7 (wall) and 9. The bogey fence on the first-round track was the final obstacle, the triple combination. On Day 1 (Thursday), a total of 37 horse-and-rider combinations started, on Day 2 (Friday) there were 32 in the competition and today the field was reduced to 24 for the deciding competition. 5 clears in round 1 – Maikel van der Vleuten/VDL Groep Verdi (NED), Rolf-Goran Bengtsson/Casall La Silla (SWE), Kevin Staut/Silvana HDC (FRA), Steve Guerdat/Nino des Buissonnets (SUI), Rich Fellers/Flexible (USA). 19 horse-and-rider combinations started in Round 2. Vertical at fence 7 was 1.62m high and penultimate vertical stood at 1.61m. Riders from 12 nations competed on the final day – USA, Qatar, Germany, Egypt, Ireland, Australia, Portugal, The Netherlands, France, Sweden, Belgium and Switzerland. Just two in third-round jump-off against the clock. 6 fences, 7 jumping efforts in jump-off course. Fellers and Flexible’s victory today is the first for the USA in 25 years. The last American winner was Katharine Burdsall with The Natural back in 1987. 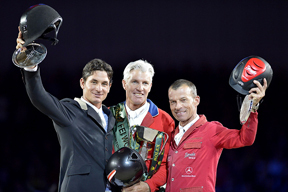 Rich Fellers – Commentary on winning round.